Walter Elias Disney (December 5, 1901 – December 15, 1966) was an American film producer, director, and screenwriter. He is most remembered for being a leading pioneer in animation and innovative amusement parks. He was a visionary entrepreneur who founded, along with his brother Roy O. Disney, Walt Disney Productions, and the Disney World and Disneyland entertainment complexes. His animated cartoon characters, such as Mickey Mouse and Donald Duck, would became cultural icons recognized throughout the world in media from film to advertising. Walt Disney was a complex person who, by his own admission, suffered two nervous breakdowns in his lifetime, did not have a particularly happy childhood, and saw many of his movies fail at the box office. Yet, he did not let personal setbacks deter him from his purpose to entertain the people with a bit of fantasy to brighten the spirit when ordinary life can be drab and sorrowful. Despite disappointment that he and his wife could only bear one child (they adopted a second), he created Disneyland out of his love for his daughters and for children in general. Disney's movies and theme parks have brought wonder, magic, and joy to millions throughout the world. The subjects of his films were fairy tales, classic children's books, true inspirational stories, and the frontiers of science—always with a positive message. In all his work, he maintained a high standard of wholesome family values coupled with a sense of idealism, optimism, and good humor. Walt Disney was nominated for a record 48 Academy Awards and seven Emmys, and was awarded the Presidential Medal of Freedom by Lyndon B. Johnson in 1964. 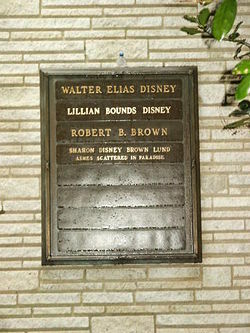 Born December 5, 1901, Walter was the son of Flora and Elias Disney, and had three brothers and one sister. 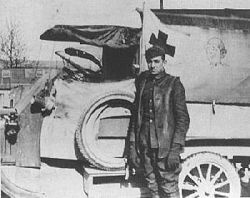 Disney as an ambulance driver during the war. Walt Disney's ancestors emigrated from Gowran, County Kilkenny, in Ireland. His father moved to the United States after his parents failed at farming in Canada. He settled in Chicago soon after his marriage to Flora Call where their five children were born. In April 1906, Elias moved his family to Marceline, Missouri, and tried his hand at operating a small farm. The family experienced several moves as Elias Disney pursued various ways to support his family. They moved back to Chicago in 1917, where young Walt took night courses at the Chicago Art Institute. Disney's childhood, in some ways, was circumvented by the Disney children's need to go to work and help contribute to the struggling finances of the family. Disney dropped out of high school so he could join the Army, but at 16 he was underage and told he could not enlist. Instead, he decided to join the Red Cross. His mother forged Walt's birth certificate saying he was born in 1900 instead of 1901. The Red Cross sent him to France for a year where he drove an ambulance covered with his drawings of imaginative characters. After his war experience, Disney moved to Kansas City, Missouri, to begin his career as a commercial artist, working on ads for newspapers, magazines, and movie theaters. It was there that he met a shy cartoonist named Ubbe Iwwerks. The two decided to start their own art business and formed a company called "Iwerks-Disney Commercial Artists" in January 1920. Their business failed but Disney used the experience to launch his historic march into Hollywood history. When Disney arrived in Los Angeles, he had $40 in his pocket and an unfinished cartoon in his suitcase. Disney stated that his first ambition was to be a film director of live action films, but he was rejected by every major studio. He then turned to something more familiar—animation—and set up his first cartoon studio in a garage in an uncle's house. He started out with the Alice in Cartoonland series, which he peddled to local theaters. Roy Disney agreed to go into business with his brother and was to become his financial partner throughout the years. Together they started Disney Brothers' Studio in the Silver Lake district, where the studio remained until 1939. Their road to success began with the creation of cartoons, like The Silly Symphonies during the silent era, and, later, with what would become the iconic character of Mickey Mouse. 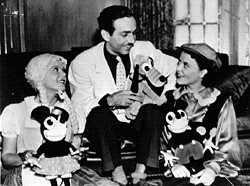 Disney introduces his popular creations: Mickey, Minnie Mouse and Pluto to Hansel and Gretel (Dorothy Rodin and Virginia Murray). By 1927, Disney was looking for a new approach to his cartoons; a new "star" was born with the creation of a mouse. Originally named "Mortimer," he was soon christened "Mickey Mouse" by Lillian Disney who felt the name "Mortimer" was too serious. Disney himself performed as the voice of Mickey Mouse until 1946. After seeing the movie The Jazz Singer (the first talking picture), Disney decided to make an all-sound talking and music cartoon, starring Mickey Mouse, called Steamboat Willie. Within the next eight years Mickey Mouse began to appear on everything from watches to toys to comic books and soon became one of the most recognized characters in the world. For a number of years Disney feared he would only be remembered as the creator of Mickey Mouse. He once complained, "Fancy being remembered around the world for the invention of a mouse." In 1932, Disney received a special Academy Award for the creation of Mickey Mouse, and soon spin-offs were launched for supporting characters such as Donald Duck, Goofy, and Pluto. In 1925, Disney hired a young woman named Lillian Bounds to ink and paint celluloid. He was soon taken with his new employee and they would often go for drives together in the hills of Los Angeles. While on a date he asked her if he should buy a new car or a ring for her finger. They were married on July 15, 1925, and, unlike many Hollywood marriages, theirs lasted for over 40 years. As Mickey's co-creator and producer, Disney was almost as famous as his mouse cartoon character, but he remained a largely private individual. His great hope was to have a large family; however, the Disneys' first attempts at pregnancy ended in miscarriage. This, coupled with pressures at the studio, led to Disney having "a hell of a breakdown," as he referred to it. His doctors recommended a vacation and the couple went on a cruise to the Caribbean. Eventually, Lilly gave birth to a daughter, Diane Marie Disney, on December 18, 1933. The Disneys then adopted Sharon Mae Disney, born on December 21, 1934. Even though his studio produced the two most successful cartoon series in the industry, Disney's ambition was to make longer films. In 1934, he began plans for a full-length feature. When other film industry executives learned of Disney's plans to produce an animated feature-length version of Snow White, they dubbed the project "Disney's Folly" and were certain that the project would destroy the Disney studio. Both Disney's wife and brother tried to talk him out of the project, but he was undeterred. He employed the Chouinard Art Institute to supervise training for the studio staff, and used the Silly Symphonies as a platform for experiments in realistic human animation, distinctive character animation, special effects, and the use of specialized processes and apparatus such as the multiplane camera. His focus on staff training and the use of animation students elevated the technical level of the studio to a position where it could produce a quality feature that matched Disney's vision. The success of Snow White proved Disney's detractors wrong and earned Disney an Oscar—one full-sized one, and seven miniature Oscar statuettes. In 1939, the feature animation staff, after completing Pinocchio, began work on Fantasia and Bambi, while the shorts staff continued work on the Mickey Mouse, Donald Duck, Goofy, and Pluto cartoon series. Shortly after Dumbo was finally released in October 1941, the United States entered World War II. The U.S. Army contracted for most of the Disney studio's facilities and had the staff create training and instructional films for the military. The military films did not generate income, however, and the feature film Bambi underperformed when it was released in April 1942. By the late 1940s, the studio had recovered enough to continue production on the full-length features Alice in Wonderland and Peter Pan. They also began work on Cinderella. Some Disney analysts believe that the studio would have gone bankrupt during the war years if it were not for the U.S. military films that Disney produced. During the mid-1950s Disney produced a number of educational films on the space program in collaboration with NASA rocket engineer Wernher von Braun, including Man in Space and Man and the Moon in 1955, and Mars and Beyond in 1957. The films attracted the attention of both the general public and the Soviet space program, which was in keen competition with the United States' program at that time. In the late-1940s, Disney began to draw sketches of his ideas for an amusement park where he envisioned his employees spending time with their children. Disney, who had a lifelong love of trains, knew that he wanted the park to be surrounded by a train. He had once constructed a miniature steam locomotive in his backyard for his daughters, complete with loops, overpasses and a tunnel that went underneath his wife's flower garden. Disney assigned a small group of employees to work on Disneyland development as engineers and planners. They were appropriately dubbed the "Imagineers." As Walt Disney Productions began work on Disneyland, it also began expanding its other entertainment operations. Treasure Island (1950) became the studio's first all-live-action feature, and was soon followed by such successes as 20,000 Leagues Under the Sea (in CinemaScope, 1954), The Shaggy Dog (1959), and The Parent Trap (1961). Although movies were seen to be in competition with television by Hollywood producers, The Walt Disney Studio was one of the first to produce projects for this new medium. Disney created its first TV special, One Hour in Wonderland, in 1950. The studio's first daily television show, the popular Mickey Mouse Club, debuted in 1955 and continued in various incarnations into the 1990s. This show would become a platform for new and rising stars like Annette Funicello—one of the original Mouseketeers. 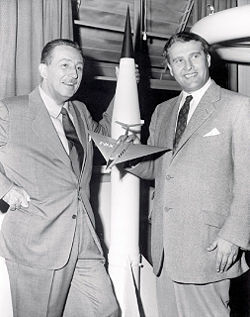 Walt Disney meets with Wernher von Braun. As the studio expanded and diversified into other media, Disney devoted less of his attention to the animation department as he entrusted most of its operations to the key animators, whom he dubbed the Nine Old Men. During Disney's lifetime, the animation department created the successful Lady and the Tramp (in CinemaScope, 1955), One Hundred and One Dalmatians (1961), the financially disappointing Sleeping Beauty (in Super Technirama 70mm, 1959) and The Sword in the Stone (1963). Disneyland, one of the world's first theme parks, finally opened on July 17, 1955, and was immediately successful. Visitors came from around the world to see attractions based on successful Disney films and their well loved characters. After 1955, the Disneyland TV show became known as Walt Disney Presents. The show went from black-and-white to color in 1961—changing its name to Walt Disney's Wonderful World of Color. It eventually evolved into what is today known as the The Wonderful World of Disney, which continued to air on ABC until 2005. Since 2005, Disney features have been split between ABC, the Hallmark Channel, and Cartoon Network via separate broadcast agreements. It currently airs periodically, with features such as the December 2005 revival of Once Upon a Mattress. Despite all it ups and downs, by the early 1960s Walt Disney Productions had established itself as the world's leading producer of family entertainment. After decades of trying, Disney finally procured the rights to P.L. Travers' books about a magical nanny. Mary Poppins, released in 1964, was the most successful Disney film of the 1960s, combining animation and live-action. The movie starred Julie Andrews, who won an Oscar for her performance, and a memorable musical score. Many hailed the live-action/animation combination feature as Disney's greatest achievement. The same year Disney debuted a number of exhibits at the 1964 New York World's Fair, including Audio-Animatronic figures, all of which were later integrated into attractions at Disneyland and the new Florida project that would be called Disney World. In 1964, Walt Disney Productions began quietly purchasing land in central Florida southwest of Orlando. Even though the property was considered swamp land, prices in the area rose quickly when it was discovered that Disney was buying the property for another project like Disneyland. Disney World would become a larger, more elaborate version of Disneyland, whose central theme park would be called the Magic Kingdom. Additionally, it would also feature a number of golf courses and resort hotels. The heart of Disney World, however, was to be the Experimental Prototype City (or Community) of Tomorrow, or EPCOT for short. EPCOT was designed to be an operational city where residents would live, work, and interact using advanced and experimental technology, while scientists would develop and test new technologies to improve human life and health. In late 1966, after many years of chain-smoking cigarettes, Disney was diagnosed with lung cancer. He died from cardiac arrest on December 15, 1966, ten days after his 65th birthday and three years before the completion of Disney World. He was cremated at the Forest Lawn Memorial Park in Glendale, California. Roy O. Disney worked to finish the "Florida project," and died just three months after the Magic Kingdom opened in 1971. At his funeral the song, "When You Wish Upon a Star" (the popular song from Pinocchio) was played in Disney's honor. Roy Disney said of his brother, "He was really in my opinion, truly a genius—creative, with great determination, singleness of purpose, and drive; and through his entire life he was never pushed off his course or diverted to other things." 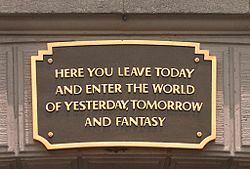 Plaque at the entrance that embodies the intended spirit of Disneyland by Walt Disney: To leave reality and enter fantasy. Today, Walt Disney's animation/motion picture studios and theme parks have developed into a multi-billion dollar television, motion picture, vacation destination and media corporation that carries his name. The Walt Disney Company today owns, among other assets, five vacation resorts, eleven theme parks (in such diverse locations as Paris, Tokyo, and Hong Kong), two water parks, thirty-nine hotels, eight motion picture studios, six record labels, eleven cable television networks, and one terrestrial television network. Disney was a major benefactor for The California Institute of the Arts (CalArts). When he died, one fourth of his estate went towards CalArts. He also donated 38 acres (154,000 m²) of the Golden Oaks ranch in Valencia for the site of a new campus which opened in 1971. CalArts is one of the largest independent universities in California today, largely due to the generosity of the Disney family. In October 2003, the 2,265 seat Walt Disney Concert Hall was officially dedicated in Los Angeles and became the home of the Los Angeles Philharmonic and Los Angeles Master Chorale. It was first conceived in May 1987, when Lillian Disney made the initial gift of $50 million to build an additional performance space on Los Angeles County land as a tribute to her late husband Walt and his dedication to the arts. Traditional hand-drawn animation, the foundation of success of the Walt Disney Company, no longer continues at the Walt Disney Feature Animation studio. After a stream of traditionally-animated features in the late-1990s and early 2000s failed financially, Disney's main studio in Burbank was converted to a computer animation production facility. In 2004, Disney released their final traditionally animated feature film, Home on the Range. In early 2006, Disney Studios payed $7.4 billion in stock to acquire Pixar Animation Studios—a deal that put Apple Computer CEO Steve Jobs on Disney's board of directors. With the purchase, some interest in the traditional style of animation resurfaced in the form of The Frog Princess, a 2008 film animated traditionally. Thank You Walt Disney, Inc., a non-profit corporation in Kansas City, Missouri was formed to preserve Disney's original animation studio "where the mouse was born." Their plan is to recreate Disney's 1922 office and to include an interactive animation lab that will educate kids of all ages on the art and history of animation. 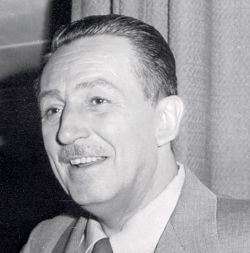 Among his many awards, Walt Disney currently holds the record for having the most Academy Awards; 22 wins, and 4 honorary. 1969 Best Short Subject, Cartoons for: "Winnie the Pooh and the Blustery Day"
1959 Best Short Subject, Live Action Subjects for: "Grand Canyon "
1956 Best Documentary, Short Subjects for: "Men Against the Arctic"
1940 Honorary Award for: Fantasia (1940) Shared with: William E. Garity and J.N.A. Hawkins for their outstanding contribution to the advancement of the use of sound in motion pictures. 1940 Irving G. Thalberg Memorial Award, established in 1937, the Thalberg is the only award that is not an Oscar and is given to a creative producer who has been responsible for a consistently high quality of motion picture production. ↑ Bob Thomas, Walt Disney: An American Original (New York: Hyperion, 1976, ISBN 0-7868-6027-8). ↑ Thank You Walt Disney, Inc. Thankyouwaltdisney.org. Retrieved April 10, 2009. Barrier, Michael. 1999. Hollywood Cartoons: American Animation in Its Golden Age. Oxford: Oxford University Press. ISBN 0-19-516729-5. Broggie, Michael. 1997. Walt Disney's Railroad Story. Virginia Beach, Virginia. Donning Publishers. ISBN 1563420090. Eliot, Marc. 1993. Walt Disney: Hollywood's Dark Prince. Carol. ISBN 1-55972-174-X. Mosley, Leonard. 2002. Disney's World: A Biography. Chelsea, MI: Scarborough House. ISBN 0-8128-8514-7. Gabler, Neal. 2006. Walt Disney: The Triumph of American Imagination. New York: Random House. ISBN 0-679-43822-X. Schickel, Richard, and Ivan R. Dee. 1997. The Disney Version: The Life, Times, Art and Commerce of Walt Disney. Chicago: Ivan R. Dee, Publisher. ISBN 1-56663-158-0. Sherman, Robert B., and Richard M. Sherman. 1998. Walt's Time: From Before to Beyond. ISBN 0-9646059-3-7. Thomas, Bob. 1991. Disney's Art of Animation: From Mickey Mouse to Beauty and the Beast. New York: Hyperion. ISBN 1562828991. Thomas, Bob. 1976. Walt Disney: An American Original. New York: Hyperion. ISBN 0-7868-6027-8. "Walt Disney." American Decades. Gale Research, 1998. Reproduced in Biography Resource Center. Farmington Hills, Mich.: Thomason Gale. 2007. "Walt Disney" Business Leader Profiles for Students. Vol. 1 Gale Research, 1999. Reproduced in Biography Resource Center. Farmington Hills, Mich.: Thomson Gale. 2007. Watts, Steven. 2001. The Magic Kingdom: Walt Disney and the American Way of Life. University of Missouri Press. ISBN 0826213790. Williams, Pat and Jim Denney. 2004. How to Be Like Walt: Capturing the Disney Magic Every Day of Your Life. HCI. ISBN 0757302319. All links retrieved August 20, 2013. "Home Page", Walt Disney Family Museum. Don Swaim with Leonard Mosley, "Audio Interview with Leonard Mosley about Walt Disney", Wired for Books. Neil Gabler, "Inside Walt Disney", National Public Radio. Sean Griffin, "Walt Disney Programs (Various Titles)", Museum of Broadcast Communications. "Home Page", Official Disney Parks. This page was last modified on 20 August 2013, at 14:27.